My name is Joe and I’m riding a Pedersen. I was visiting a friend in Copenhagen a long time ago — 15-20 years ago — and I saw a lot of them there and I just thought they looked cool and I wanted to experience one. Are there really a lot of them there? Hundreds? There are tons of them. As you move closer and closer to Christiania where they’re made there’s more and more of them. Christiana is kind of a squatter town inside of Copenhagen and the bike store that makes them is there. It’s called Christiana Bikes. Years later I sort of kept my eyes out for them and every once in a while I would see one. There was a guy selling them in California and I happened to be near where he was at one point and he showed them to me and I got to ride one. 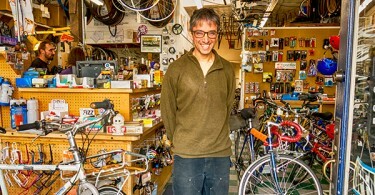 But then I was living in Germany and just as I was about to leave Germany and come back to Seattle I saw one in my bike shop that I always went to — a used one. This one’s a little over 40 years old. He told me that it was made outside of Frankfurt and it was real cheap so I just brought it home with me. It was about 400 Euros, which at the time was maybe $500 US. Have you done much customization on it? Nothing. I put some reflective things on it and fenders but I’m just keeping it running. All the components are exactly the same as any other bike except some of the frame stuff and the seat stuff. So I’ve had to do little things to the seat to keep it going. 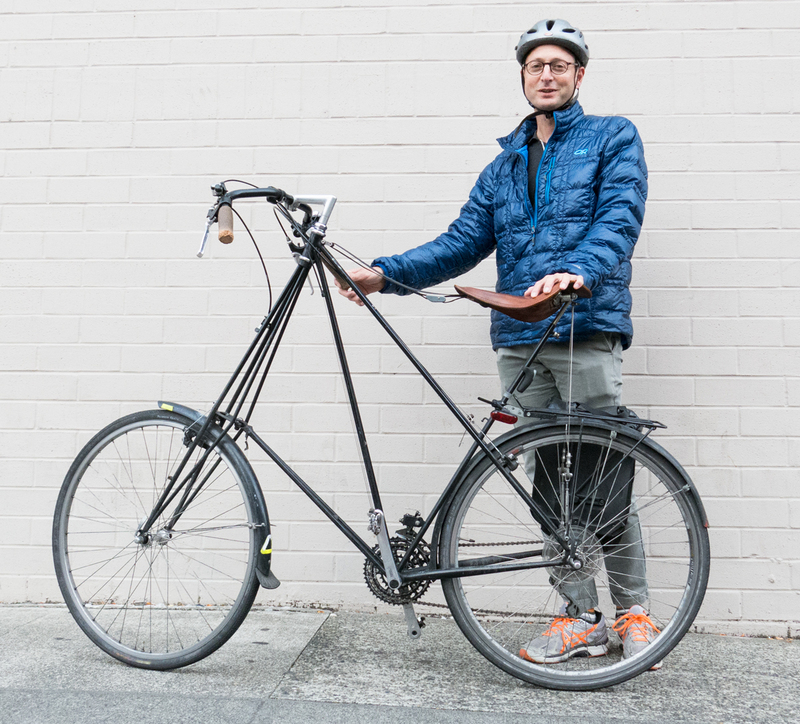 I love that it handles really well — that I sit upright — and that I’m a little bit taller so I can see better. And I feel more visible to cars. That’s the other thing. I feel bigger and more visible to cars. I feel safe on this bike. I imagine riding a Pedersen is a lot like riding a horse. How’s it handle going downhill? Downhill it’s amazing! I fly down hills. That to me is its best feature. You sit over the back wheel a lot. I think that might be why. Is there anything else you want to say about your Pedersen? Sometimes I think it’s fun to have an interesting looking bike because it draws a little bit of attention to biking in general. When we are stopped at a light people always ask me if it’s a folding bike and also say it looks really light. I tell them it doesn’t fold up and it’s pretty heavy. Then I think to myself it would be really nice if it folded. 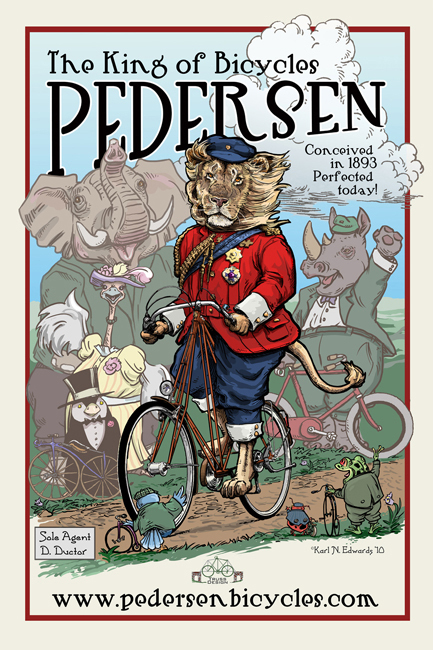 Master illustrator and bicycle enthusiast Karl Edwards was commissioned to create this poster for Pedersen Bicycles. Click here to learn about Karl’s process for creating the poster. One if by land, two if by sea. 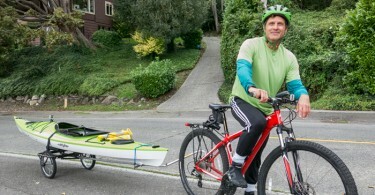 Having it all with kayak & bike.